The first of its kind from the creator of the iconic Iced Capp, Creamy Chocolate Chill is the chocolateyist, creamiest frozen treat you’ll have to have this summer. OAKVILLE, ON – May 5, 2015 – From music charts to movie theatres, summer is all about the hits. When it comes to the drink of summer 2015, Tim Hortons has it covered with its newest menu innovation, Creamy Chocolate Chill – a decadent frozen drink hand blended with real cream and layer upon layer of chocolaty goodness that’s the first of its kind from Tim Hortons. It’s so delicious, it’ll have you from the very first sip. Tim Hortons Iced Capp and Iced Coffee lead the cold specialty coffee category, representing nearly eight out of every 10 drinks sold in Canadian quick-service restaurants. Since entering the category, Tim Hortons has continued to expand its cold and frozen beverage lineup with innovations like Fruit Smoothies and Frozen Lemonade, and it now leads the overall cold specialty beverage category with more than 50 per cent market share. 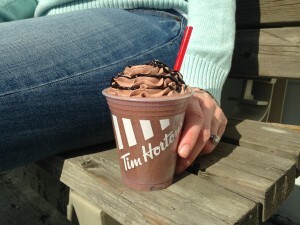 The introduction of Creamy Chocolate Chill, which performed exceptionally well in sensory research, fills a menu gap at Tim Hortons and rounds out its specialty frozen treat roster. Its one-of-a-kind creamy chocolaty taste is expected to be a game changer for the brand. Tim Hortons wanted to show guests that the layers of chocolaty awesomeness in the new Creamy Chocolate Chill will elevate their taste experience to a higher level. Literally. So with the help of Britain’s Got Talent finalist, Canadian illusionist Darcy Oake, they outfitted a Tim Hortons restaurant with hidden cameras and surprised guests and team members with a fun levitation illusion. Lots of preparation and rehearsal culminated in this live event that defies logic. To see a “Higher Level of Chocolaty,” visit BIT.LY/1ZWKSUU. For more information about the new Tim Hortons Creamy Chocolate Chill, join the #ChoChill conversation on TWITTER or INSTAGRAM using @TimHortons and on Facebook at FACEBOOK.COM/TIMHORTONS.